UPDATE: Since this article was originally published, Jenelle Bonifield has won the illustrious title of Errazuriz Wine Photographer of the Year in the Pink Lady Food Photographer of the Year’s produce category. Her image“Press 2” was taken at LDV Winery in southern Arizona. Over 7000 images were entered from 60 countries in the prestigious international competition. The distinguished panel of judges included Jamie Oliver’s photographer David Loftus, Ruth Rogers of The River Cafe, The Telegraph's Xanthe Clay, and Nigel Atherton, Group Editor, Photography, Time Inc. The winners were announced on Tuesday, April 26, at London’s world-renowned Mall Galleries, where her photograph was exhibited. This award-winning photo image will be on display at LDV Winery and available for purchase in several formats. Visit this link for information on the special photography reception taking place on May 13. It was a breathtaking moment when I learned via Twitter that my photograph had won Errazuriz Wine Photographer of the Year - Produce category. I was unable to attend the awards ceremony in London, so I was following it live via social media. I could not believe it when I saw my image displayed as a winner. I felt so blessed that I not only made the first cut among 7000 entries, but was shortlisted, then one of 400 finalists, and then finally a category winner. Having my image surface on so many websites and news feeds is just fabulous. I am grateful for the support from my colleagues and for the support of LDV Winery in this project. Vineyard photography is a passion of mine, and it is very satisfying to be acknowledged for my work. I feel very blessed. As you read through many of my articles, features, and interviews on this website, the beautiful pictures by my friend and talented photographer Jenelle Bonifield of Food & Lifestyles stand out. I'm blessed to know her and so grateful for her collaboration. On December 12th, her current exhibit debuted at the Lawrence Dunham Wine Gallery in Old Town Scottsdale. "Through the Grapevine" features her stunning photography of Arizona wine country, vineyards, and grapes. Where are you from? I grew up in Texas, moved to Maryland in high school and remained there for several decades before settling in Arizona. I have been in Arizona 24 years. I am married, have two daughters, one son, one stepson, and one stepdaughter. There are seven grandchildren between us, and another soon to arrive. How did you get into the visual arts? At University, I majored in visual communications, and studied photography. I became a graphic designer and worked for several R&D corporations. I learned video design and worked at TV stations in Washington, D.C. and Arizona. After working at KPNX 12 in Phoenix for a bit, my husband and I decided to start our own animation and video design studio in 1992. We won many national and a few international film festival awards along the way (that company was active until 2014. when I decided to pursue photography full-time.) One of our clients was Food & Lifestyles AZ Magazine. While working on their TV show I became interested in the food, wine, and cocktail industry. The magazine and show are no longer and when I decided to start my photography business, I took a variation of that name. What led you into food styling and photography? A producer, Debby Wolvos, on the TV show Food & Lifestyles AZ, and I reconnected on another project several years later. She started a food photography business that was very interesting to me. She mentioned she could use a food stylist. I decided to train and learn all I could about food styling and team up with Debby whenever the opportunity was right. Along the way, I picked up my camera and enjoyed second shooting with her, as well as venturing out on my own. My husband has been very supportive with my photography endeavor. I have a terrific support system – friends, family and co-workers that encourage me. What do you enjoy shooting? I love photographing food, wine, and cocktails, all kinds of restaurants, farm-to-table events, and food trucks. I LOVE ARIZONA - the vineyards, botanicals, landscape, back country roads, and people from all walks of life. When I travel I like to photograph interesting places and people. I like finding details in everything. What draws you to the vineyards? Former clients and friends, Peggy Fiandaca and Curt Dunham, from my former business, have a vineyard in southern Arizona, LDV Winery. 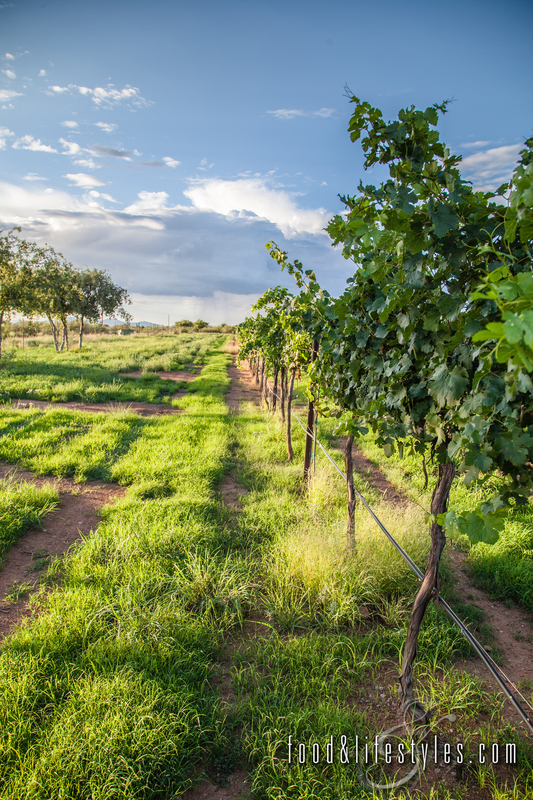 I visited it often through the past several years and developed a deep love of vineyards and southern Arizona - the pristine skies and mountains, the small country roads, vast fields of produce, amazing sunrises and sunsets. The interaction of the sunlight and the grapes was fascinating to me. The vivid greens, yellows, purples, pinks and reds at various times of their life cycle made the grapes an ever-changing subject to capture. I kept asking to come back to photograph, and started taking part in the harvest process as well. It’s my Zen, with camera in hand, wandering through the vineyard. Every row is unique and waiting to be discovered. How did you choose the photos for your exhibit? I wanted to keep it vineyard-themed for LDV. It was really difficult narrowing down the thousands of images I had of grapes and grapevines! I tried to find the most varied images to give a snapshot of the vineyard at different times of year. I also tried to range from close-ups to wider images. I asked for input from several people to derive a balanced selection. Do you have any favorites? It's really hard to have favorites. Just like my kids, they are all unique and have their own magic! I do love the varietals with the explosion of color. Plans for the future? I am excited for the 2016 vintage and documenting every stage at LDV Winery again this year. I am researching galleries and avenues to sell my images. I am interested in doing more macro imagery. I also would like to incorporate video with stills.